Nothing’s stopping you: Five years ago, you needed thousands of dollars and an established company to get your hands on a development kit from Nintendo, Sony, or Microsoft. To make things worse, there were no successful distribution channels for anything but the $20+ category of games. If you were an 18 year old kid in 2005, you had better go to college, get a degree, and apply for a job in the game industry once you graduated if you wanted to make video games. Today, the barrier to entering the video game industry has never been lower. The iPhone dev kit costs $100, the Android dev kit is free. Kids these days aren’t trying to get jobs in the game industry, they can create their own jobs in the industry. The playing field is open. Quality and success are no longer determined solely by multi-million dollar investments and large development teams. For example… When I was 18, back in ’09, I started an iPhone game development studio with a few friends called Manifold Studios (shameless plug, my apologies.) We decided we would make games on a starving college kid budget that would have production values riveling those that the big boys produced (EA Mobile, Gameloft, Rovio, etc…) Take a look at our first shot, WarSquared (still in beta), and judge for yourself. It’s not just us though. Check out Robozzle, Helicopter, Bubble Ball, and Airy Labs. They all come from an under 20 crowd. We’re all doing it, and so can you. What’s in a game? Three things. Design, code, and art. Telling good design from bad deserves a post of its own, but in general the key is scaling your design to your means. This is tough – if you take a look at the Unity (a 3D engine for game development) forums, everyone wants to make a Massively Multiplayer Online (MMO) game. Never mind that the budgets for these games are usually counted in the millions, everyone thinks they can make one. They can’t. A simple mobile game is the place to start, period. The conventional wisdom: Conventional wisdom about mobile games goes something like this: there are so many out there that it is impossible to get noticed, nobody will ever discover your app, and you will never make any money. Success is relative to investment. Yes, if you pour 100k into an app, you’ll be really upset if it only ever brings in 75k. But if you develop the game on your own time with a few hundred bucks, you’ll be really happy to make 75k. And again, it’s all about making your design match your means. If you have money to promote your game, you will want to design it differently. If you have the money and connections to promote your app, by all means make a paid app. But if you know upfront that you don’t, then you probably want to make your app a free one with in-app purchases. Then you have to try and pass the freemium tipping point. What is the tipping point you ask? Read on. The tipping point: Everyone really should be using something like Flurry nowadays – how are you supposed to improve your app if you don’t have reliable data on how people are using it? And to get that data, you need some number of downloads, which you’re going to get because you will e-mail every blog, site, Youtuber, and so on, who covers apps. You’ll get mentioned somewhere, and you’ll get a few thousand downloads. Assuming you have reliable data on your users, you can easily measure if you’ve passed the tipping point: you make more money per download than it costs you to get that download. The world of incentivized downloads and app advertising is changing week to week, so don’t take the numbers I quote here to be reliable, but let’s say it costs you 35 cents to buy a download of your free app and you are generating an average of $1 per download. You’re past the tipping point. You’re home free. You make $1.85 on every $1.00 you spend. You will probably be able to find someone interested in publishing your game, or at least the justification to pour some money into it yourself. Figure out what your budget is, and what your means are. How many artists and programmers will be able to work on the game. Make sure your design is scaled to your means. Get your game out as soon as possible. If you never release your app, you are guaranteed to fail. It sounds stupid, but the number of professionals who fall into this trap is huge. Ship early, ship often. Assuming your game operates on the freemium model, tweak and iterate. Try new things often. Update as frequently as you can. Analyze your metrics, play with the design, change the menus, and do what it takes to get past the tipping point. Once you pass the tipping point, congratulations, you’re doing better than most pros. You’ve proven that in today’s video game industry, the little guy can play in the big leagues. 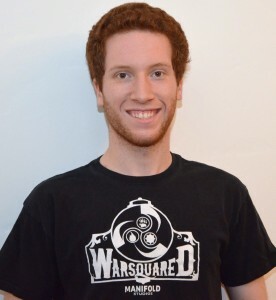 * Jeremy Rossmann is a rising junior at MIT joint-majoring in comparative media studies and mathematics with computer science. He is the CEO and Lead Designer at Manifold Studios, an iPhone game development startup he founded comprised of high school and college students. Their first game, WarSquared has been featured by Apple on the App Store.